This article is about the American football player and running back who played for the University of Florida and the Detroit Lions. For the American football player and running back who played for Mississippi State University and the Dallas Cowboys, see James Jones (running back, born 1958). James Roosevelt Jones (born March 21, 1961) is an American former college and professional football player who was a running back in the National Football League (NFL) for ten seasons during the 1980s and early 1990s. Jones played college football for the University of Florida, and thereafter, he played professionally for the Detroit Lions and the Seattle Seahawks of the NFL. Jones was born in Pompano Beach, Florida in 1961. He attended Blanche Ely High School in Pompano Beach, where he was a star high school football player for the Blanche Ely Mighty Tigers. Jones was so versatile in his ability to play multiple positions that he was nicknamed the "Franchise." Parade magazine named him as a high school All-American after his senior season. In 2007, twenty-eight years after he graduated from high school, the Florida High School Athletic Association (FHSAA) recognized Jones as one of the "100 Greatest Players of the First 100 Years" of Florida high school football. Jones received an athletic scholarship to attend the University of Florida in Gainesville, Florida, where he played for coach Charley Pell's Florida Gators football team from 1979 to 1982. During Jones' sophomore season in 1980, he was a member of the Gators team that posted the biggest one-year turnaround in the history of NCAA Division I football—from 0–10–1 in 1979 to an 8–4 bowl team in 1980. He was a team captain in 1981 and 1982, a first-team All-Southeastern Conference (SEC) selection in 1981 and 1982, and a third-team/honorable mention All-American in 1982. He also received the Gators' Fergie Ferguson Award, recognizing the "senior football player who displays outstanding leadership, character and courage," in 1981. Jones finished his Gator career with 2,026 yards rushing, 593 yards receiving and forty-eight yards passing, and led the team in rushing yardage for three consecutive seasons from 1980 to 1982. He was later inducted into the University of Florida Athletic Hall of Fame as a "Gator Great" in 1998. In a 2006 article series published by The Gainesville Sun, the Sun sportswriters ranked him as the No. 45 all-time greatest Gator from the first century of the Florida Gators football team. The Detroit Lions selected Jones in the first round (thirteenth pick overall) of the 1983 NFL Draft, and he played for the Lions from 1983 to 1988. 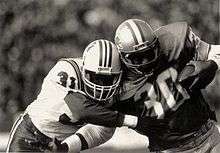 Jones started off for the Lions blocking for Billy Sims but became the featured back for the Lions in 1985 when Sims was injured. Jones played with Garry James from 1986 to 1988 and the tandem became known as the "James Gang." Jones' best game with the Lions was in week 1 of 1986 in a 13–10 win over the Vikings; he rushed for 174 yards on thirty-six carries and was recognized as the NFC offensive player of the week for his performance. Jones was traded to the Seattle Seahawks in 1989 for defensive back Terry Taylor, and he finished his NFL career with the Seahawks in 1992. Jones finished his ten-season NFL career having played in 135 games, started ninety-one of them, rushed for 3,626 yards and twenty-six touchdowns on 1,010 carries, and caught 318 passes for 2,641 yards and ten touchdowns. Jones became the head football coach for his high school alma mater, Blanche Ely, in 2007, but he resigned in May 2008 after a single season. 1 2 Pro-Football-Reference.com, Players, James R. Jones. Retrieved July 6, 2010. ↑ databaseFootball.com, Players, James Jones. Retrieved June 4, 2010. 1 2 3 4 2011 Florida Gators Football Media Guide, University Athletic Association, Gainesville, Florida, pp. 87, 96, 103, 124, 138–140, 147–148, 182 (2011). Retrieved August 29, 2011. ↑ Norm Carlson, University of Florida Football Vault: The History of the Florida Gators, Whitman Publishing, LLC, Atlanta, Georgia, pp. 95–96 (2007). ↑ College Football Data Warehouse, Florida Yearly Results 1975–1979. Retrieved July 18, 2010. ↑ College Football Data Warehouse, Florida Yearly Results 1980–1984. Retrieved July 18, 2010. ↑ Pat Dooley, "Jones, Nattiel lead class into UF Hall," The Gainesville Sun, pp. 1C & 5C (April 3, 1998). Retrieved July 23, 2011. ↑ Robbie Andreu & Pat Dooley, "No. 45 James Jones," The Gainesville Sun (July 20, 2006). Retrieved April 3, 2013. ↑ Pro Football Hall of Fame, Draft History, 1983 National Football League Draft. Retrieved June 4, 2010. ↑ National Football League, Historical Players, James Jones. July 6, 2010.